Magnapinna atlantica (formerly known as Magnapinna sp. A on this page) was originally described from two specimens taken from the North Atlantic. The holotype (US National Museum of Natural History cat. no. USNM 1086800) is a juvenile female, 59 mm ML, and was captured intact with damage only to the tips of the appendages. The paratype (Natural History Museum, London, cat. no. BMNH 20060134) is a juvenile male, 53 mm ML and was captured in relatively good condition. Recently subadult and adult males were captured and these are described here. tentacle bases narrower than adjacent arm bases. 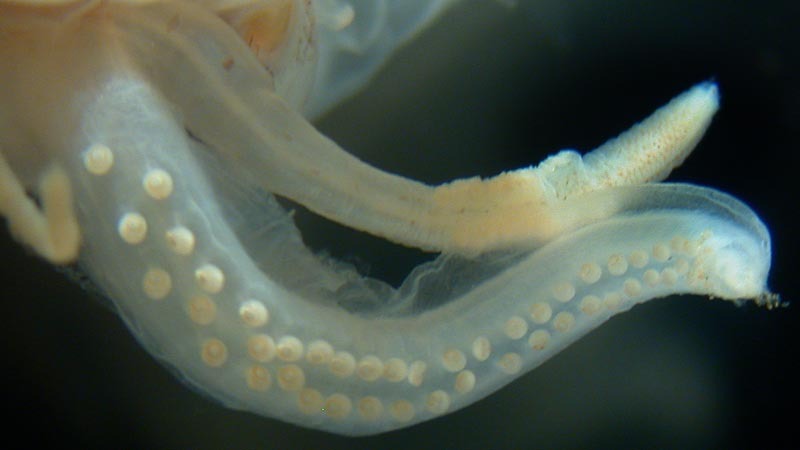 proximal tentacle without suckers but with glandular structures. Proximal-arms with suckers in two series (except at tips in some proximal-arms), ocasionally appearing slightly irregular. Proximal-tentacles more slender than arms IV. Proximal- tentacles short, thin and without suckers; distal-tentacles (filaments) very narrow and bearing small suckers mostly around 0.08 mm in diameter. Distal third of proximal-tentacle with large, apparently glandular, lobes. Figure. Left - Oral view of the brachial crown of M. atlantica, holotype. Right - Oral view of the left proximal tentacle and arm IV of M. atlantica, holotype, showing their relative thicknesses and the glandular regions of the proximal tentacle (yellowish tint). The distal tentacle and arm are missing. Note the broad lateral membrane on arm IV. Photographs by R. Young. Fins extremely large, about 90% of the mantle length. Fins appear not to have been drawn-out into V-shaped point. Tail presently a bare gladius with tip missing; extends at least 4 mm beyond fins. Figure. Dorsal view of the posterior half of the fins of M. atlantica showing fin shape and the short gladius extending beyond the fins. Head, mantle, funnel, collars and fins with numerous scattered chromatophores. Figure. Dorsal view of a portion of the fins of M. atlantica, holotype, showing large chromatophores. This description is based on the holotype. More details of the holotype's description can be found here. The paratype is a smaller specimen (53 mm ML) and in less perfect condition. Information on the paratype can be found here. M. atlantica is very different from M. pacifica. (1) M. pacifica has much broader proximal- tentacles than proximal-arms while M. atlantica has much narrower proximal-tentacles than proximal-arms. 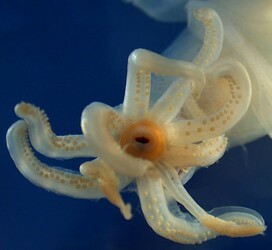 (2) M. pacifica has proximal-tentacles that are covered with numerous suckers while M. atlantica has proximal-tentacles that carry only a few or no suckers. (3) M. pacifica has proximal-arm suckers in three or four series distally while M. atlantica has proximal-arm suckers in two series. 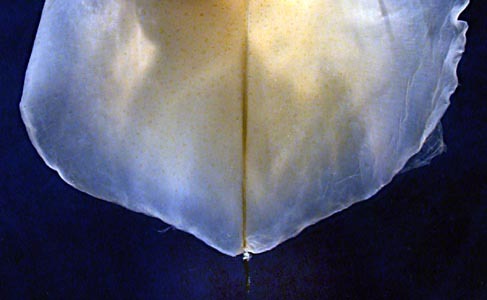 (4) M. pacifica, unlike M. atlantica, lacks glandular regions on their proximal-tentacles. M. atlantica is similar to M. talismani and Magnapinna sp. C. The latter is poorly known and there is still some uncertainties concerning the identity of M. talismani. The mantle length (61 mm) and fin length (54 mm) of M. talismani holotype are nearly identical with those of M. atlantica (59 mm, 53 mm) but the diameter of the buccal mass, the size of the arm suckers and the thickness of the arm basis all suggest that M. talismani either had very different body proportions or, more likely, that it is actually a much larger individual (see photograph below). At present, the only clear difference that separates M. atlantica from M. talismani and Magnapinna sp. C is the presence of glandular regions on the proximal-tentacles. While the tentacles of the holotype of M. talismani where badly damaged, one recently described specimen assigned to M. talismani (see the M. talismani page on the ToL) has proximal tentacles in in fairly good condition and they show no trace of glandular regions. The absence could be size related but this seems unlikely. Figure. Oral-oblique views of the buccal region of the holotypes of Magnapinna atlantica (left) and M. talismani (right). 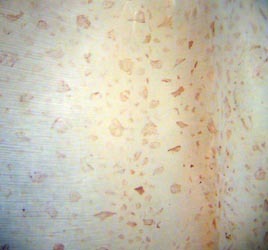 Photograph modified from Vecchione and Young (2006). Type locality. Gulf of Mexico, North Atlantic at 27°09’N, 86°07’W on 16 Sept., 1995. It was captured intact with damage only to the tips of the appendages. The paratype was captured over the mid-Atlantic Ridge near the Azores at 37°14'N. 32°18'W on June 21, 1997. The subadult male was taken by the R/S ALVIN from the N.W. Gulf of Mexico (26°10'51"N, 94°37'22"W) at a depth of 2739 m. The adult male was taken by theR/V R.S. CARNEY from the N.W. Gulf of Mexico (26°05'00"N, 94°36'30"W) in a beam trawl that fished at a depth of 2928-2849 m in May of 2006. Fischer, H. and L. Joubin. 1907. Expéditions scientifiques du TRAVAILLEUR et du TALISMAN. Céphalopodes, 8: 313-353. Hardy, A. 1956. The Open Sea. Fisher, J., J. Gilmour, J. Huxley, M. Davies, and E. Hosking, Eds., Collins, London, 1956. M. Vecchione, R.E. Young, A. Guerra, D.J. Lindsay, D.A. Clague, J.M. Bernhard, W.W. Sager, A.F. Gonzalez, F.J. Rocha, and M. Segonzac. 2001. 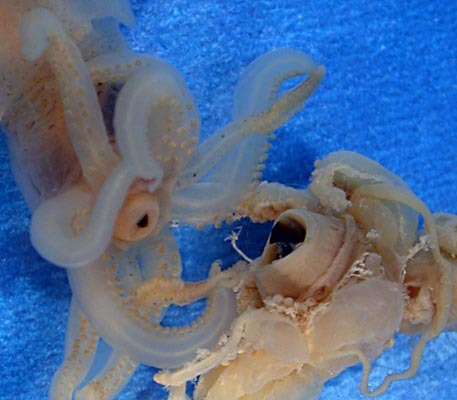 Worldwide observations of remarkable deep-sea squids. Science, 294: 2505-2506. Vecchione, M. and R. E. Young. 2006. 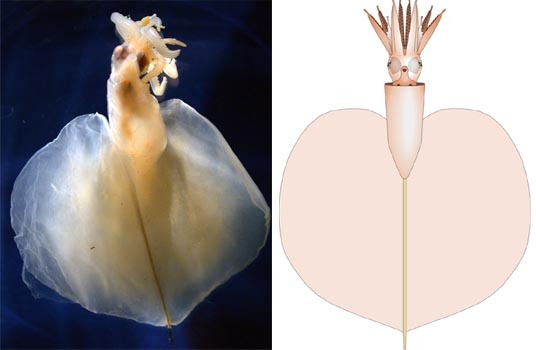 The squid family Magnapinnidae (Mollusca; Cephalopoda) in the North Atlantic with a description of Magnapinna atlantica, n. sp.. Proc. Biol. Soc. Wash. 119 (3): 365-372. Page: Tree of Life Magnapinna atlantica Vecchione and Young 2006. Authored by Michael Vecchione and Richard E. Young. The TEXT of this page is licensed under the Creative Commons Attribution-NonCommercial License - Version 3.0. Note that images and other media featured on this page are each governed by their own license, and they may or may not be available for reuse. Click on an image or a media link to access the media data window, which provides the relevant licensing information. For the general terms and conditions of ToL material reuse and redistribution, please see the Tree of Life Copyright Policies.